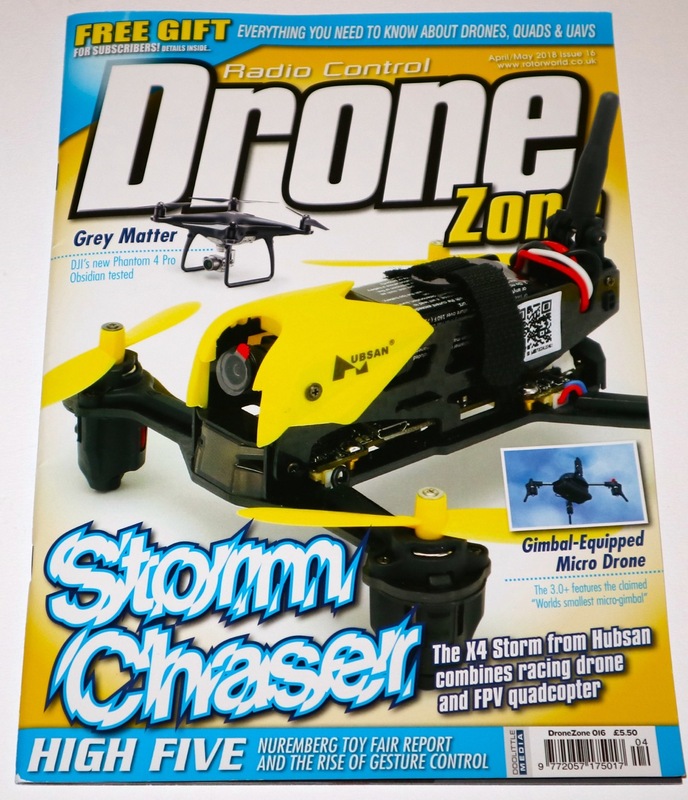 Here’s something I certainly wouldn’t have chosen to ever fly or review, but DroneZone sent it over and asked me to write a review on it, which I did…. and spoiler alert, I hated it. It was way over priced, used old technology, and worst of all it managed to get $3M from an Indigogo campaign where the video which suggested the footage was coming from the MicroDrone quite clearly came from something like a DJI Phantom. After writing the review for it, which actually came over as if I wasn’t completely full of hate for it, I felt compelled to make a video for YouTube warning people that this wasn’t exactly what it reported to be. The article as it’s written here has slightly less pictures in than the magazine – this is because the magazine got it and took some of the box/unboxing pictures that were used – I’ve added a few that I’d taken, but it’s slightly different. The MicroDrone 3.0, from Extreme Fliers was, in marketing terms, a runaway success. Achieving $3.6m (or 3078% funding) on Indegogo and featuring in numerous media reports. Whilst they should be congratulated for this, I found their crowd funding accompanying video somewhat dubious to say the least. Whilst it’s never actually claimed, or stated in the video, that all the shots featured are coming from the MicroDrone, the impression is certainly given that this little machine can produce stunning aerial images to rival the likes of DJI. In short, it can’t – but lets take a look what it can do. 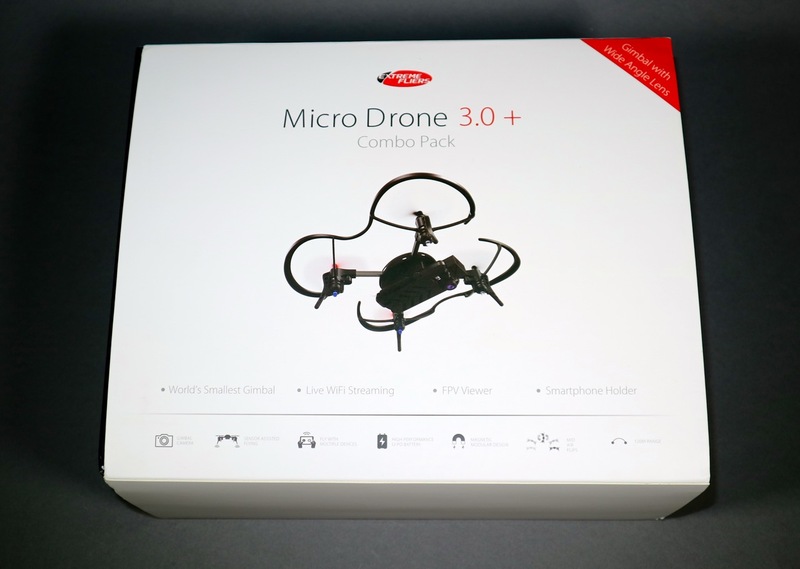 I got my hands on the latest and greatest MircoDrone 3.0+ Combo Pack. 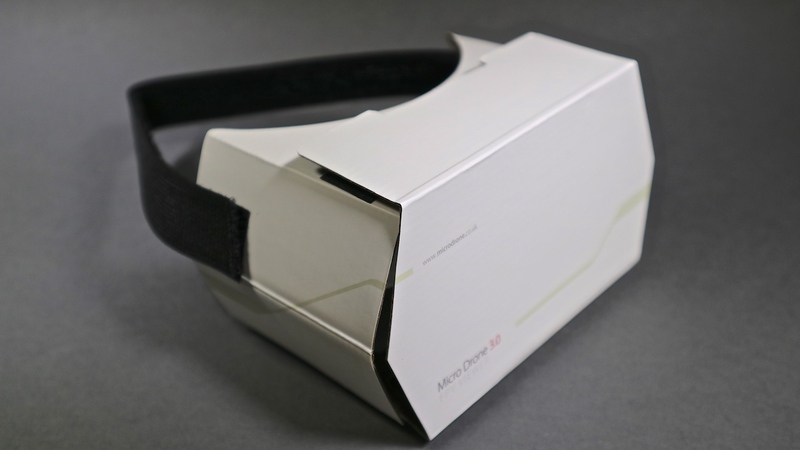 The combo pack includes the drone itself, a radio with smartphone holder, a single 1 cell 550mah li-ion battery and charger, a set of spare props, prop removal tool, prop guards, and a FPV viewer in the form of a foldable cardboard VR viewer – much like the google cardboard. The big feature in this combo pack is the new Wifi camera module, which features a single-axis gimbal. The concept behind the gimbal is that instead of your view tilting forward and backwards as you pitch forwards/backwards to change your speed, the gimbal will tilt the camera up and down to keep your view steady. You are also able to manually tilt the gimbal via the controller for the exact view you want. We weren’t off to the best of starts in my combo pack, as I noticed one of the switches on the radio had fallen off and there were several tiny pieces of switch parts rattling around. The radio has a 3 position switch for slow/fast/insane rates and a 2 position switch for the gimbal. 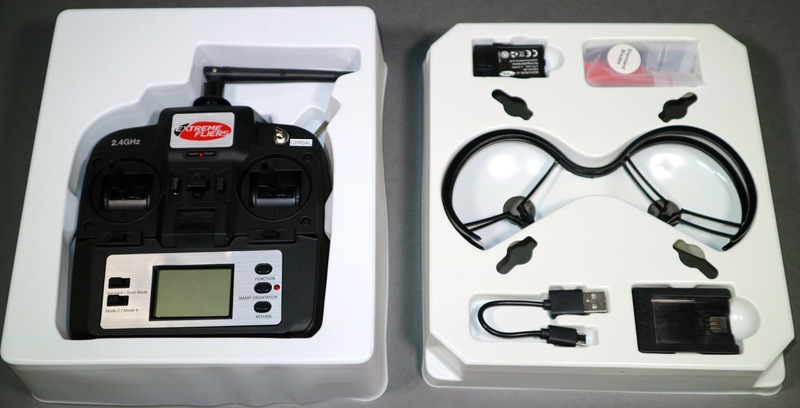 It also features a small LCD display giving a few details such as the transmitters battery level. On the left side of the LCD panel there are two switches on to flip between Standard and Stunt flying, and Mode 2 or Mode 4 stick layout. Finally, on the right hand side of the panel, there 3 buttons. Function (for starting/stopping recording on the camera), Smart Orientation and Return – more on these later. The radio feels a little flimsy and the sticks very loose in the centre positions, but as a toy-grade radio, it feels ok to use. It’s toy-grade credentials were very obvious when I opened up the radio to repair the broken switch. It’s small 2.4Ghz antenna only just protruded out from the main PCB, and didn’t extend up into the external antenna cover – which is just a dummy. Given that the control range is only claimed at 150m, aside from the fact that it would be cleaner without the dummy external antenna, this shouldn’t be an issue. 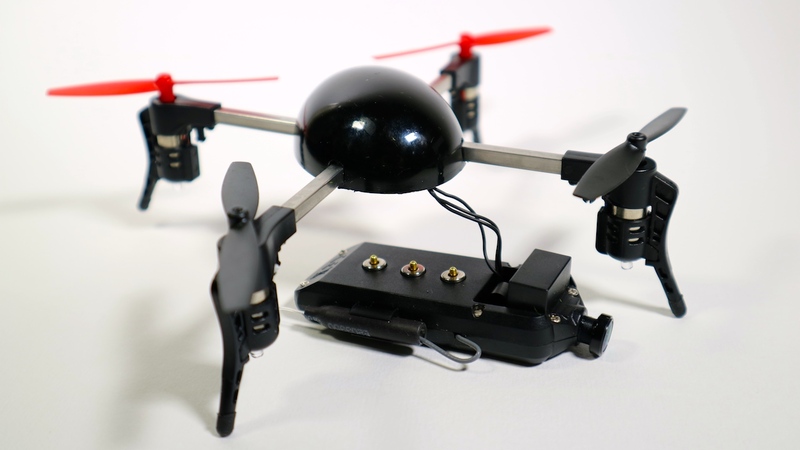 What is the MicroDrone ? The drone itself is a 136mm (motor to motor) brushed quad with a proprietary flight controller running 65mm props. It does have a few interesting features however, that make it a more interesting prospect. The design is modular, and so every component is designed to be easily swapped over. Break a leg, for example, and it’s a single screw and one plug to remove and the leg can be replaced with a new one. 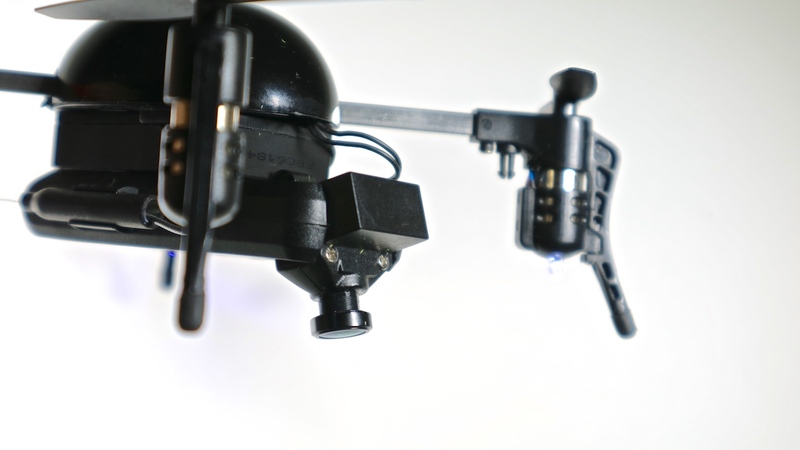 The proprietary battery has a 3 pin connector that slots in easily underneath the drone. On the underside of the battery are 3 exposed magnetic pads. This make it easy to add accessories with the magnets both providing a secure fix and power to the accessory. The Wifi camera attached in this way – the only problem was that the gimbal control needed to be connected to the expansion port on the flight controller. This somewhat defeated the object of the easy accessory connection, with the camera hanging by it’s gimbal control wire – as without the battery in place there’s nothing to connect it to. 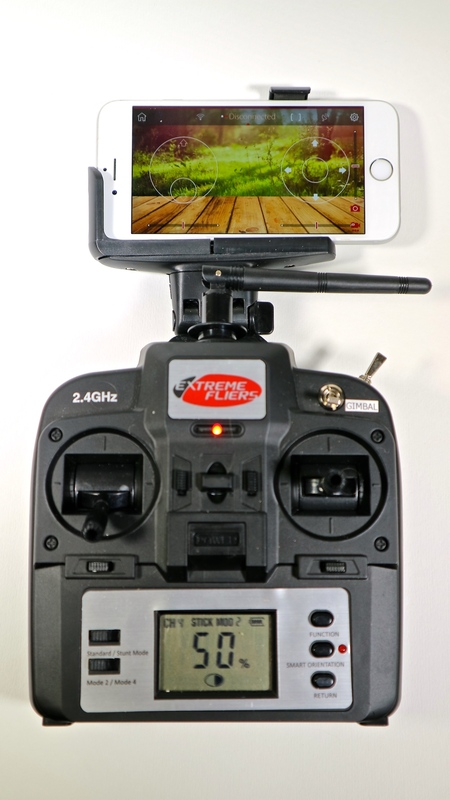 The MicroDrone has it’s own smart phone app that runs on either Android or iOS phones. The Wifi camera on the MicroDrone will create it’s own Wifi network for you to join, and then simply start up the app and go. The App is quite flexible in that it allows you to configure things to use both the radio and smart phone for different functions. You can actually fly the MicroDrone just on the app, but aside from the reduced range of using a phone for the control input and FPV, I found the lack of physical feedback from the sticks made using just the phone quite difficult. My chosen setup was to use the phone simply as an FPV screen and the radio for all the control inputs. Taking the MicroDrone into the air for the first time, my first impression was that it felt heavy. It was sluggish to respond to increases in the throttle, and the inertia it carries when as you change direction takes a bit of getting used to. I managed to put it into the ground a few times after attempting to pull out of a descent only to see my full throttle input not having enough power to do so. Weight is not necessarily a bad thing though, what you lose in agility you make up for in some ways in stability. The MicroDrone was less twitchy and was able to handle the wind better than lighter quads in this size range. 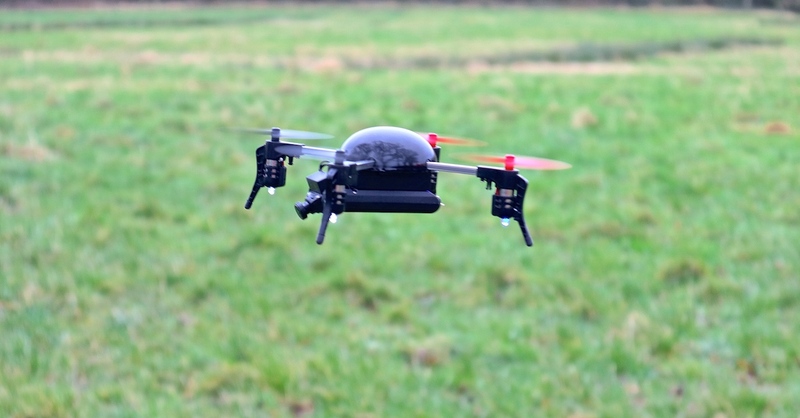 Once you get used to the weight, the MicroDrone is easy to fly. Although there are three rates, even “insane” isn’t as crazy as it sounds and as the drone self-levels in all modes. Simply letting go of the right stick (in mode 2) will allow the quad to come back to level. One issue I found though is that the yaw movement isn’t proportional. Whether you move the yaw stick a little bit or slam the stick all the way over, the speed of the yaw is the same. This is a shame, as you lose the ability to make micro adjustments that are sometimes needed to line things up. Although there’s no “Acro” mode in the traditional sense, there is a “Stunt Mode” switch. With this switch enabled pushing the pitch/roll stick to the full extent of the movement will flip the quad in that direction. At this point the flight controller takes over, performs the flip and then returns control to you. An LED at the base of each of the motors (white at the front, blue at the back) will help with finding the small drone in the sky and working out it’s orientation. If you lose your way though, there’s a Smart Orientation button available, using it will mean that pulling back on the pitch control will bring the quad towards you – no matter which way it’s facing. It’s a useful mode if you want to get a selfie and you aren’t confident about flying nose in. A Return button is also provided, the idea being that the quad will fly back towards you. It works in much he same way as Smart Orientation in that it knows which way you were facing when you took off, and knows to go in the opposite direction to return. 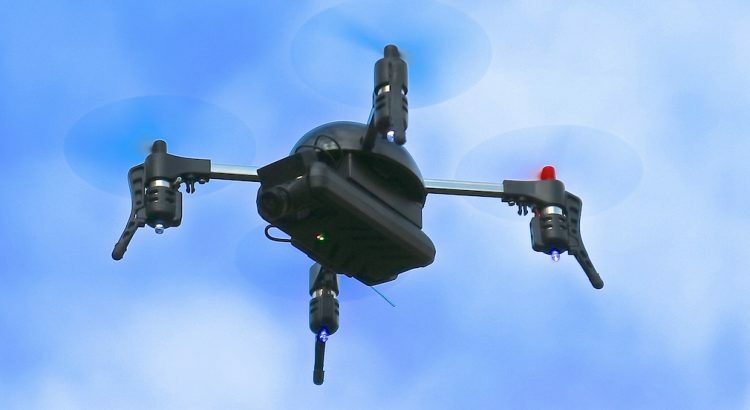 Of course, without any positioning system such as a GPS, the MicroDrone has know idea if it’s moved sideways in the wind so it’s a feature to use with caution. The are two problems in using FPV via a WiFi signal on your phone. Firstly the range isn’t great. Typically I was getting around 30-40m of range, but it’s tricky to tell because of the second problem, and that is one of inconsistent frame rates and lag. I found that I really couldn’t fly using just the FPV feed as image would shutter too much, and sometimes freeze up for a few seconds before returning. When you had a proper signal (i.e very close in) I was able to use the screen to line things up, but I had to constantly flick back between looking at the screen and the drone just in front of me to check the drone was where I thought it was. 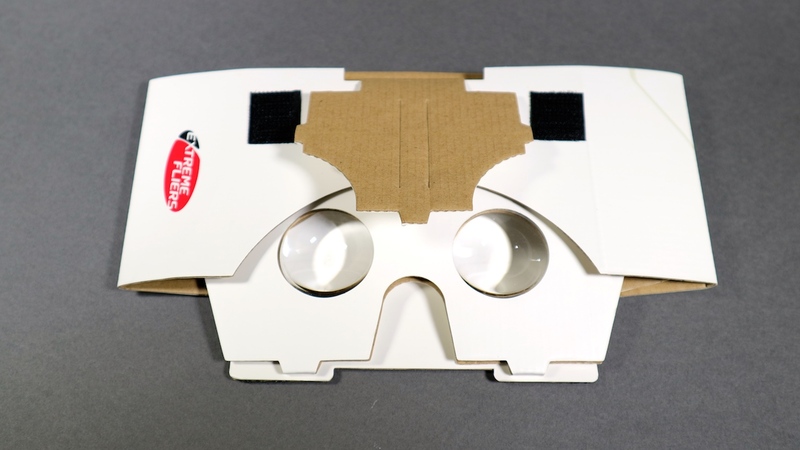 Consequently, I didn’t feel that trying the google cardboard-esque FVP goggles was going to end well, and only flew using my phone in it’s holder. You are able to record video on the phone or onboard the camera (with the additional of an SD card). I would suggest investing in a micro SD card for flying the MicroDrone, as phone recordings will record the stutter in the video, are only recorded at 20fps, and for some reason the resolution seems to be stuck at 640×480. Using the SD in the camera gives an improvement. The frame rate is increased to 25fps, the resolution is 1280×720, but the bit rate is very low. At less than 2Mbps the recordings end up suffering from a lot of digital noise, and look quite blocky. The gimbal reacts quite well to the pitch of the quad and you are able to avoid the issue of the camera looking directly into the grass as you tilt forward to fly fast. It is servo based though, so does tend to be a little bit jerky as it moves up and down. You can manually pitch the camera up and down whilst in flight by using the gimbal switch on the radio. You do lose a certain amount of control of the quad whilst you adjust this though, so it requires some forward planning. Once you activate the gimbal switch, your pitch control becomes the camera control, so you position the camera as you’l like it and then disable the switch. Obviously, during this time you are unable to control the pitch of the quad. It’s a little awkward, but as long as you get the quad into a stable hover beforehand, and are quick to reposition the camera, it’s quite workable. Some people might prefer using the app for the camera tile control, but you’d still need to take a hand off of a stick to use it. 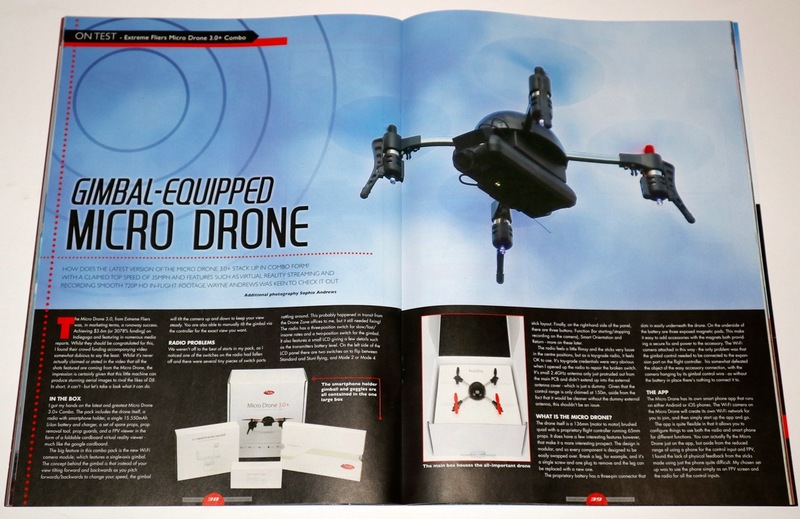 Whilst the MicroDrone has some interesting features and ideas, it doesn’t really stand out as being particularly exceptional. 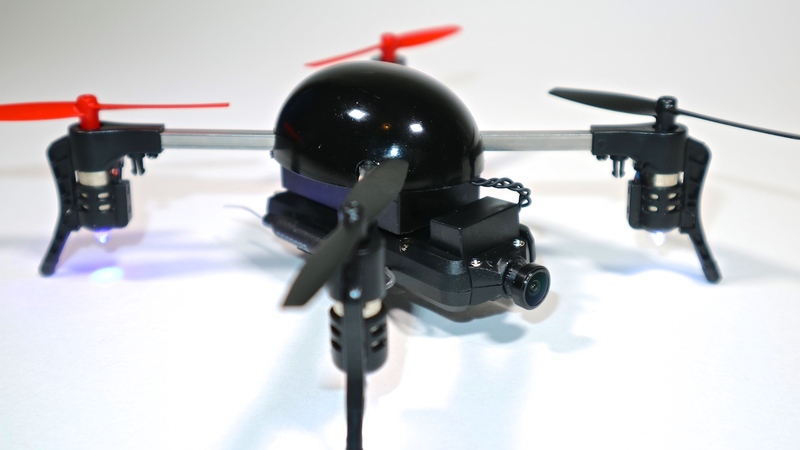 The gimbal is quite innovative, but the poor camera and FPV system means it’s not being used to it’s full potential, and as a fun-flyer it’s weight means it feels slightly cumbersome in the air. The combo pack is fairly expensive compared to other RTF quads, and for this sort of money it needs to perform a lot better.